The difference between Ernst kapers Vej 1, 2450 Cph SV and Højbro Plads is 3.15 metres. 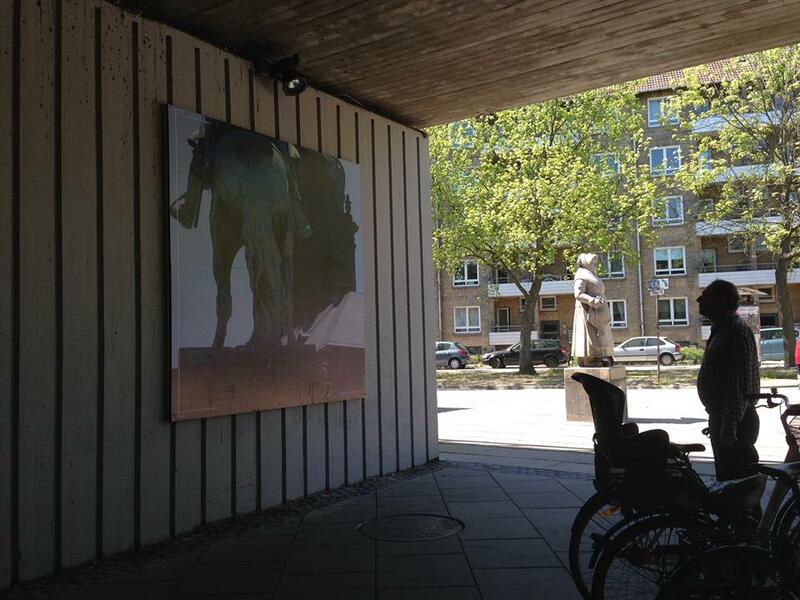 Copenhagen is currently (2015) undergoing a transformation in connection with the Metro construction, and therefore several sculptures around the city have been removed to a storeroom. For that reason, the exhibition space Sydhavn Station, proposed a project to relocate these sculptures to the small square outside Sydhavn Station for the duration of the metroconstruction. The result as a relocation of the sculpture “the fishmonger” that used to be situated in central Copenhagen right across from the big equestrian statue of Absalon (the founder of Copenhagen) and the national parliament. The fishmonger was erected in 1940 by the towncouncil in honor of the ladies who were selling fish in that spot, and perhaps also to claim, that these everyday endeavors were as worthy of having a sculpture carved as were primeministers and founding fathers. In a way this social story of what is fine enough for art, seemed to fit quite well to the social story of Sydhavn Station. Furthermore, we also had a large billboard mounted under the railway bridge next to the statue. During 2015-16, the 10 artists from Exhibition Space Sydhavn Station will exhibit works on this billboard that will accompany, frame and contextualize – or be accompanied framed and contextualized by this sculpture of another artistic time and tradition. My own contribution to the billboard was displayed in July and August, and was a 1:1 photo of the statue of the equestrian statue of Absalon that used to be the neighbouring sculpture of the fishmonger. This picture was to scale in size as well as in “height above sealevel”. Sydhavn Station is 3.15 meters higher above sealevel that Højbro Plads where Absalon is, and where the fishmonger used to stand. This means that the picture of Absalon did not fit the size of the poster, and that it was cut, so that the image of the statue would be cut at the height above sealevel of the more elevated Sydhavn Station. The picture on the billboard was then, in effect a small part of the very tall statue, and Absalon on his high horse was also suddenly more in level with the fishmonger. 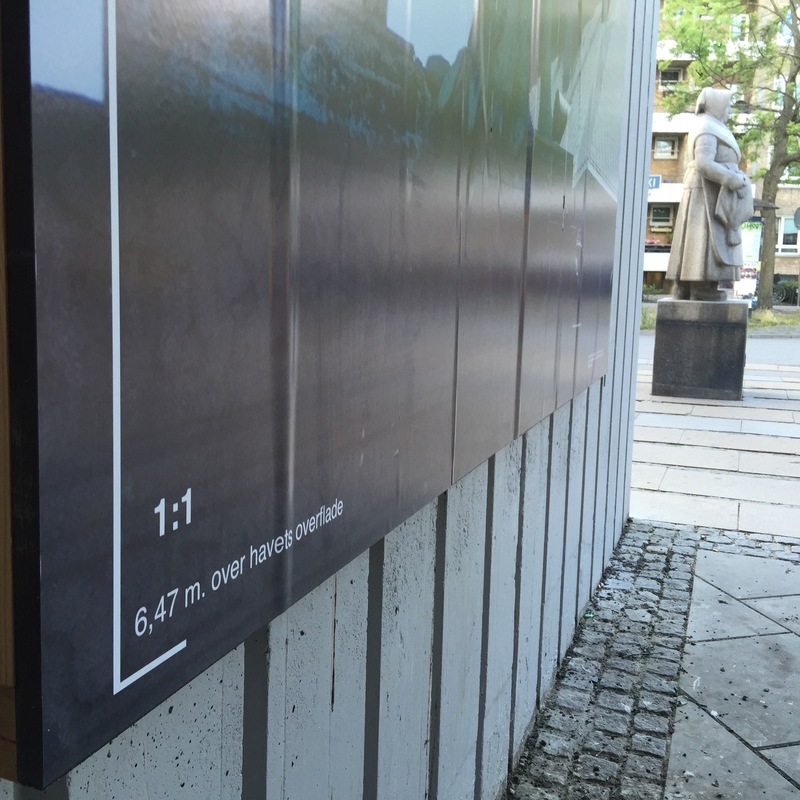 This entry was posted in 2450 Cph SV and Højbro Plads is 3.15 metres. by admin. Bookmark the permalink.